A few years ago, I saw a Kickstarter project that I didn't back. 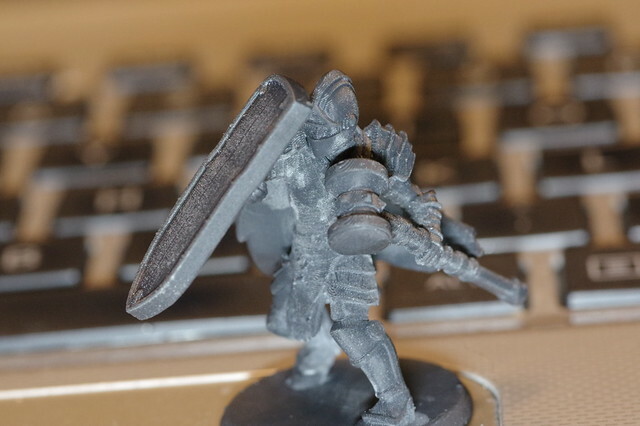 It was an attempt at creating 28mm miniatures that could be customized to be your character, and then 3D printing them. I thought it was a cool idea, but I just didn't believe it would be workable. And I was wrong. 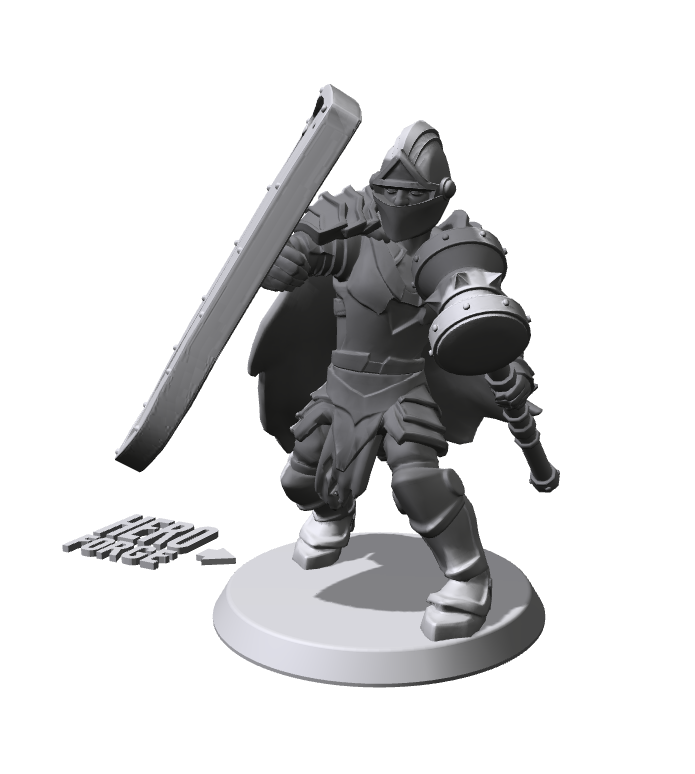 Not too long after the Kickstarter ended, they launched their website - HeroForge.com. You use their site to design your mini from their menu of parts. Then you tell them which material you want it printed in, and they generate an .stl file and send it to Shapeways for printing and fulfillment. In September, I ordered a couple of figures to check it out. More accurately, I ordered the same figure in two different materials. And I liked what I got. Then, in April, they made another material available (briefly). The strong plastic is about $15, the high-detail is around $25, and the gray is around $27. Before shipping. So now I have the same figure in three different materials from the five available. Note: Orders for Gray Plastic are currently suspended due to the crazy delays they are experiencing. I haven't ordered steel or bronze (and - honestly - am unlikely to do so). High-Detail Plastic, Strong Plastic, Gray Plastic - in that order. And I rather like it. Notice, for example, that my figure is left-handed? Try to find a left-handed figure from Ral Partha or Games Workshop or Iron Wind or anyone, really. It's crazy-hard to do because it's something that just does not occur to them. I was impressed enough with the high-detail at the time to order figures for the players in the three games I'm currently involved with. That's a total, now, of 22 figures that we've ordered. 20 of them were high-detail plastic. ... and then the dropsies started. Their materials page lists three stats for each material. Durability, Detail, and Paintability. And I'm not 100% sure I agree with their listed numbers. Durability, they give the high-detail plastic a one (out of five). That is not inaccurate. Not even a little. The strong plastic and the gray plastic have the same durability rating, and I can vouch for the surprising durability of the strong plastic - I accidentally set my (full) Risk Legacy box on top of the strong plastic figure a few weeks ago with zero damage. Detail, they give the strong plastic a one. And - again - I can't disagree with this number. Look how coarse that figure is. It'd be good for mooks, but it's not a good look for PCs. But go back to that pic with the three figures. They rate the gray plastic as being higher-detail than the high-detail plastic. And it might be, but I suspect that it's a trick of visibility, because the high-detail plastic is translucent. Light shines through it. But the black plastic? This pic is a hair over-exposed, and the figure hasn't been washed, yet. Much less primed. But wow. All in all, though, I'm very satisfied. 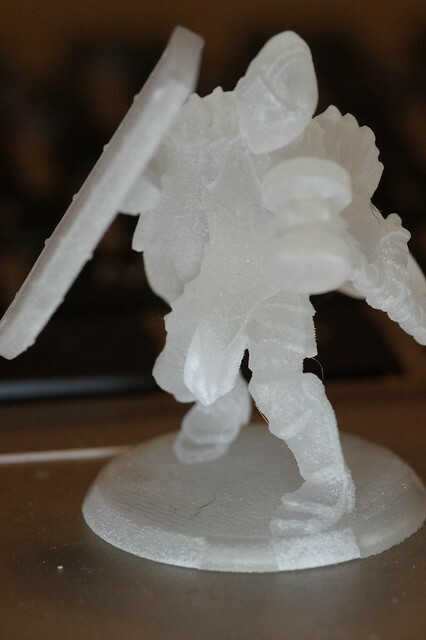 It's worth noting that 3D printing minis is suddenly A Thing. 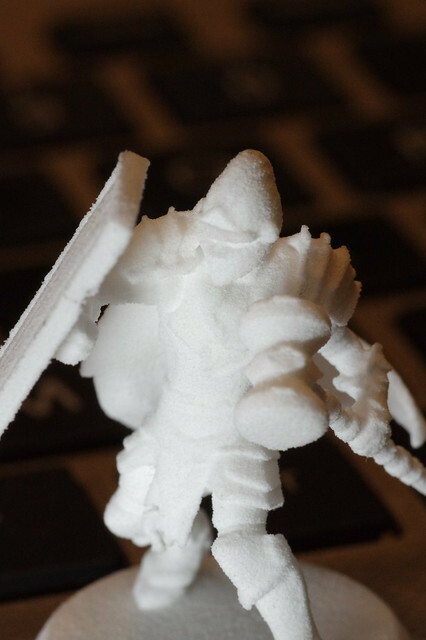 Hero Forge has some competition. 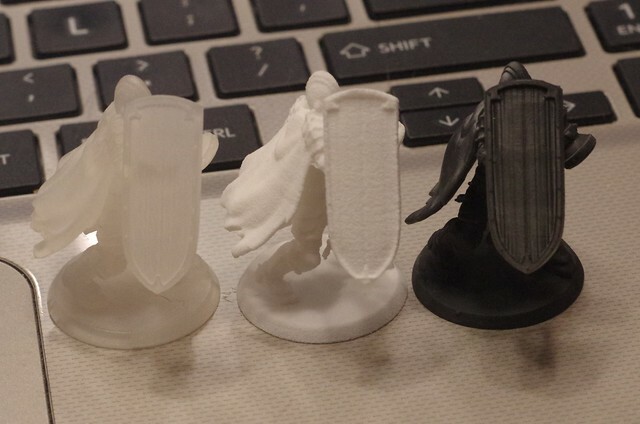 For example, DriveThruRPG has a selection of 3D printer files now, for example. But they're not custom. And I lack the skills to customize them (but there are people who don't lack those skills). 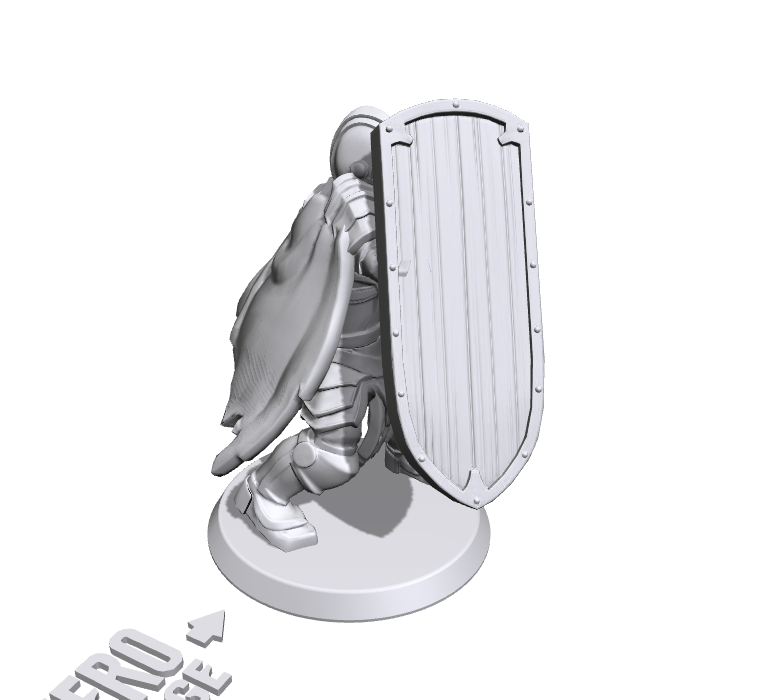 Just download the file and send that to Shapeways for printing ... it's a bit cheaper than Hero Forge's setup (but, again, isn't nearly as easy to customize). If you're thinking about ordering from Hero Forge, I will strongly recommend that you wait until the gray plastic becomes available again, though. Totally worth the extra $2. They currently estimate several weeks before they can re-launch. Does the grey come assembled or in parts? It doesn't quite look like it was run as one single print. They're 3D printed as one piece. No assembly required. To me, the lack of detail is well worth the fact that you get to customize. Especially for characters that already have several levels of... well, character, in them, e.g. my wife's crazy halfling poison master. An off-the-shelf figure would always be just not quite right, so we're thrilled with the Heroforge figure Eric bought. There's really only a lack of detail on the Strong Plastic. The other two are FANTASTIC.